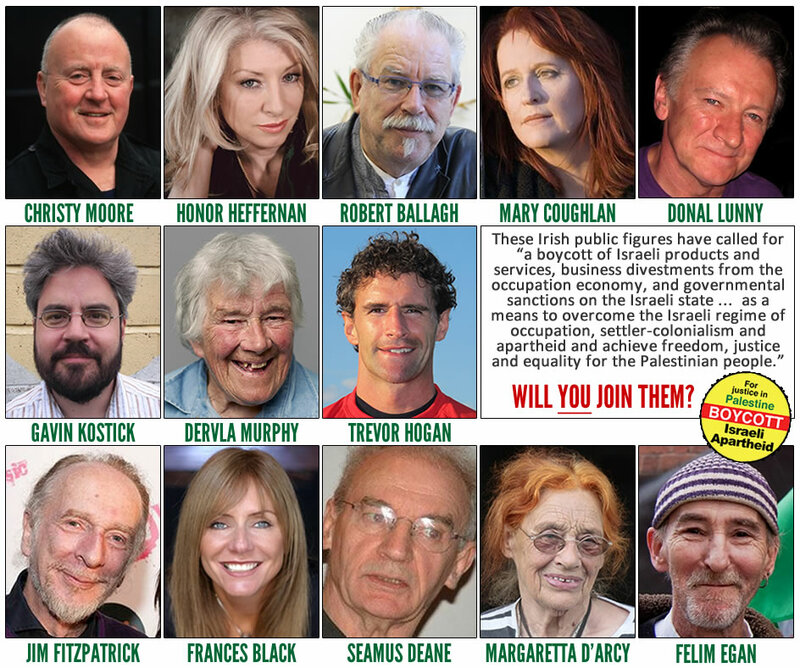 In an open letter published in today’s Irish Times and Irish Independent, thirteen of Ireland’s best-known musicians, writers, artists and sports stars have called on the Irish government to join them in supporting the growing worldwide boycott, divestment and sanctions (BDS) campaign against Israel. The statement has been welcomed by Palestinian and Irish human rights campaigners. The letter’s signatories are Christy Moore, Mary Coughlan, Robert Ballagh, Donal Lunny, Frances Black, Trevor Hogan, Dervla Murphy, Seamus Deane, Felim Egan, Margaretta D’Arcy, Jim Fitzpatrick, Honor Heffernan and Gavin Kostick. The letter welcomes Minister for Foreign Affairs Charlie Flanagan’s support for BDS as a legitimate political standpoint, but also outlines their disappointment that the Irish government does not go further and support the BDS movement, unfavourably contrasting this current stance to that taken in 1987 when the government of the day banned produce from apartheid South Africa. The statement points out that BDS is a Palestinian civil society-led global movement of citizens that carries out and advocates for nonviolent campaigns of boycotts, divestment and sanctions as a means to apply pressure on Israel’s regime of occupation, settler-colonialism and apartheid, and to help achieve freedom, justice and equality for the Palestinian people. It further outlines that many reasons to support BDS are highlighted by human rights organisations such as Amnesty International and Defense for Children International, who frequently document Israel’s extrajudicial killings, imprisonment of children, destruction of people’s homes and livelihoods, theft of Palestinian lands and routine intimidation with tear gas and bullets. The Ireland-Palestine Solidarity Campaign (IPSC) welcomed the statement, while noting that the freedom to engage in BDS is currently under threat in a number of countries. For example, New York Governor Andrew Cuomo signed an executive order last week which requires the New York State Office of General Services to create a blacklist of institutions and companies involved in the BDS movement, and to make that list available to everyone online. He went further and ordered that all state agencies would be required to divest from such companies which would have to submit written evidence to appeal to be removed from the list. In October 2015, a French court upheld the conviction of Palestine solidarity activists for publicly calling for the boycott of Israeli goods, in what campaigners say is an abuse of France’s anti-discrimination laws for political reasons. We, the undersigned, welcome the recent statement in the Dáil by Minister for Foreign Affairs and Trade, Charles Flanagan TD that the strategy of boycott, divestment and sanction (BDS) to pressure Israel into ending the occupation is a legitimate political viewpoint. It is also heartening that Minister Flanagan outlines the Government’s support for Israeli and Palestinian NGOs active on justice and human rights issues. However given this expression of support, it is both disappointing and confusing that when those same civil society organisations call on the international community to campaign for BDS as a means of showing solidarity with Palestinians living under occupation – the Irish Government refuses to support them or the campaign. The BDS movement is a Palestinian civil society-led global movement of citizens that carries out and advocates for nonviolent campaigns of BDS as a means to overcome the Israeli regime of occupation, settler-colonialism and apartheid and achieve freedom, justice and equality for the Palestinian people. It is a movement that has the same legitimacy as the anti-apartheid movement which the Irish Government supported in the 1980s, imposing sanctions on South Africa in 1987 in similar circumstances. The reasons to support BDS are systematically documented by organisations like Amnesty International, Defense for Children International, the United Nations and others which describe extrajudicial killings, imprisonment of children, destruction of people’s homes and livelihoods, theft of Palestinian lands and daily intimidation with tear gas and bullets. It is for these and many other reasons that we call for: a boycott of Israeli products and services, business divestments from the occupation economy, and governmental sanctions on the Israeli state. 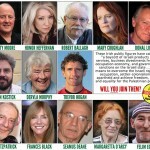 Posted June 14, 2016 in Academic Boycott, Amnesty, Apartheid, BDS, Boycott, Cultural Boycott, Defence for Children International, Divestment, Economic Boycott, Human Rights, Impunity, Irish Artists' Pledge to Boycott Israel, Irish Government, Irish Times, National Rights, Political Rights, Press releases, Sanctions, War Crimes.